Indium Corporation announces the Heat-Spring® metallic thermal interface material (TIM) specifically designed and optimized for use with Infineon Technologies AG PrimePACKTM IGBT modules. Many applications call for a TIM that can easily be placed against a backing plate and a cooling solution. Indium's Heat-Spring® is a soft metal alloy (SMA) developed as a compressible metallic shim that can be used in IGBT mounting applications. Heat-Spring has been tested for the latest PrimePACK configurations and has been optimized to reduce thermal resistance below that of other more traditional thermal interface materials. Because of the increased number of fasteners used in the PrimePACK and its decreased width base plate, the Heat-Spring is ideal for this IGBT module. Heat-Springs are soft metal preforms that are compressible, allowing for adaptation to irregularities in the mounting surface. They do not contain silicone, do not out-gas, and do not exhibit pump-out which can occur with thermal greases and other viscous materials. Heat-Springs are stable, easy to handle, and require no special mounting apparatus. They are highly conductive both thermally and electrically. Heat-Springs are also made of 100% recyclable and reclaimable metal and are considered a "green" interface material. From design through assembly, Indium's Heat-Spring delivers superior performance and overall finished goods reliability. 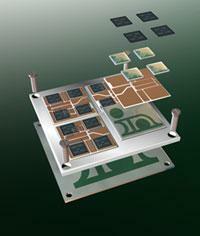 For more information about Thermal Interface Materials, visit Indium's Thermal blog: www.indium.com/blogs/TIM-Blog/. For more information about Indium Corporation, visit www.indium.com/TIM or email abrown@indium.com.